Building an effective IT support department and when not to. Choosing the right IT organization structure or the right IT organizational chart, are common issues within a growing business. They are also issues filled with many traps. I have shared my thoughts with you before this blog on the types of work that must occur in an IT department (Reactive & Proactive); today let’s talk about how you should staff the IT department to get the work done. Gartner (an IT think-tank) has suggested CEO’s should not think in terms of an IT organization model or in other words an IT org chart. Instead, CEO’s should think in terms of an IT Operating Model. I completely agree and the reason is simple. An IT Operating Model defines IT service delivery ownership and responsibility for each IT employee. In this way the IT Operating Model is an accountability framework, not a service delivery model. Each IT employee has specific things they must deliver, and if they are delivered, the company will have a great IT experience. Reactive IT Support: This is essentially anything that breaks and needs to be reactively worked on. These are Users issues, server issues and network issues. The work is never scheduled and because the issue affects IT systems it must be repaired quickly. Reactive support work always trumps all other kinds of IT work and that is why there is a second role in addition to Reactive support. 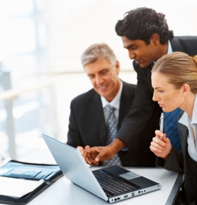 Proactive IT Tasks: This type of work is scheduled and planned for. Staffing it separately from Reactive support allows you to be assured the proactive tasks will actually get completed. By completing this work you can be assured that Reactive support will decline. Proactive work is focused on maintaining IT best-practices most of which is under-the-covers for all users. Work like patching, antivirus, malware, active directory policies, and managing and testing backups are all Proactive tasks. As you successfully implement a Proactive strategy, you should expect your Reactive work load to dramatically decrease. IT Automation Toolsets: Ideally an IT department will purchase, deploy and actively operate an IT automation tool that will automatically insure that all Proactive tasks are completed, and will notify an IT employee when they don’t work. The idea is to automate as much of the IT Proactive drone work as possible and reserve the available IT labor for the things that didn’t work as planned. Without an automation toolset, the Proactive IT employee must do everything manually, which is boring and tedious. Without an automation toolset, ultimately the IT infrastructure will break down as IT settings begin to drift away from best-practice-standards. Workflow & Service Ticketing: Once you have the team in place, you need to organize the work and manage response times and labor utilization. By purchasing a service incident ticketing product you can enable a secure portal. All of your employees enter tickets through the secure web portal. Then the system assigns the work to the appropriate IT engineer. This approach also works for the Proactive tasks; each repetitive IT task should be scheduled and assigned to the proactive engineer as the work is scheduled to be accomplished. A ticketing program also helps the IT team learn what the repetitive issues are so that the engineers can begin to become proactive and determine what the root cause issues are underlying all of the reactive incidents. Once these root-cause issues are isolated and proactively fixed under-the-covers, reactive support will go down and the User community will enjoy higher up-time. IT management or oversight: At this point you have hired two ITemployees: a Reactive and Proactive IT tech serving entirely different but both necessary roles. So who manages these employees and provides oversight to insure the work is really getting done and getting done well? An IT manager will provide the oversight and the vacation and sick day coverage for the other two technicians. But the IT manager will also serve in the role of holding strategic IT meetings with the CEO and CFO of the business. The IT manager should learn and understand the executive team's business goals so that the IT department can work towards those goals. And the IT manager must also provide meaningful dollars and cents reports about the effectiveness of his department. Data like: application up-time, network availability, reactive support desk incident numbers and the average time to remediate an incident. Proactive tasks should also be discussed and reviewed. The IT manager should be able to measure the daily and weekly utilization of his team so that management cans see where the investment in IT payroll is being spent on.